This week saw further mainstream recognition for a website shrouded in mystery, but heavily used by journalists all over the world. Julian Assange, the editor of WikiLeaks, the site which publishes and comments on leaked government or corporate documents, was awarded Amnesty International's New Media Award on Monday for 'Kenya: The Cry of Blood - Extra-Judicial Killings and Disappearances'. A Kenya National Commission on Human Rights document - not publicly available in Kenya - provided evidence that over 500 young men were killed or made to disappear in a police campaign, which may have been 'with the connivance' of the country's political leadership, WikiLeaks reported. This afternoon (Friday) CNN reported that the United Nations special rapporteur investigating the killings and disappearances 'has called for the resignation of top Kenyan officials and sweeping changes in the country's security forces to end reported widespread killings by police across the African nation'. "The material was important," Assange told Journalism.co.uk, in an interview this week. "It was difficult to get Western press attention to it. We ran it on our front page for a week. Most journalists didn't care about it. Even regular [WikiLeaks] readers didn't care about it." 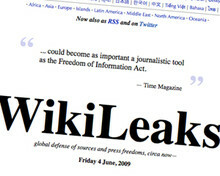 "Four people associated with investigating the killings have themselves been murdered, including the human rights lawyers Oscar Kingara and John Paul Oulo, who were assassinated driving to an afternoon meeting at the Kenyan National Commission on Human Rights in March 2009," WikiLeaks reported in a release on its site. "We despaired a bit that no-one outside Kenya cared about it," he said. "The Western press is not so aware of the work we do in the developing world." Interest from Sunday Times' journalist Jon Swain finally gave the WikiLeaks' information a higher profile in the media, but it still remained a relatively sidelined story, Assange explained. "It is a reflection of the courage and strength of Kenyan civil society that this injustice was documented," Assange said, in acceptance of the award. "Through the courageous work of organizations such as the Oscar foundation, the KNHCR, Mars Group Kenya and others we had the primary support we needed to expose these murders to the world. I know that they will not rest, and we will not rest, until justice is done." WikiLeaks' remit is to 'publish and comment on leaked documents alleging government and corporate misconduct,' according to the site, and it sees itself as one 'step' before the journalistic investigator, Assange told Journalism.co.uk. First you need the whistleblower, he said, and then WikiLeaks can publish the material. "Then someone who is familiar with that material needs to step forward to investigate it and put it in political context. Once that is done, then it becomes of public interest," he added. "We're the step before the first person [to investigate]," he said. Assange said it was common for journalists to publish documents on WikiLeaks before running stories themselves, as their publishers might be reluctant to risk legal action as a result of publication. While Assange is not overly concerned that journalists often use WikiLeaks' hosted information without attribution, he does want to promote the work the organisation does in order to attract more users and readers. Most people are not aware of the site's work; while it is better known in the defence and computing sectors, its 'reputation is growing over time,' he said. The BNP membership list leaked in November 2008 was just one example where British newspapers did not link, or even credit, the WikiLeaks source. Despite thousands of articles on GoogleNews, only a couple of items in UK linked back to the WikiLeaks page. This could be because news organisations were reluctant to signpost the original data, Assange suggested. "Our goal was to increase political reform of the world" he said, adding that since investigative journalism is a 'a large driver of political reform' it makes sense for the two to work together. New content is increasingly less investigative in its nature, he said: "the internet has made press releases and re-writing them very cheap." "As newspapers cut back on most expensive journalism, part of our goal is to decrease the input costs, by [publishing] those documents, by decreasing the legal costs. "I do know that mainstream journalists sit on an enormous number of leaked documents for economic reasons," Assange said.